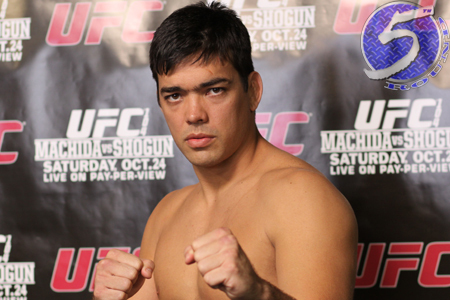 For much of his career, Lyoto Machida (Pictured) has driven opponents mad with his elusive ways. As “The Dragon” prepares to challenge light heavyweight champ Jon Jones for his crown at UFC 140, Machida isn’t sure if his style is best suited to beat “Bones,” but the 33-year-old does know he’ll stick with what got him to the big dance. “It’s hard to say what the perfect style is to stop Jones,” Machida told Sherdog. “I have a lot of trust in my skills against any fighter. I won’t change what people have seen, and I’d rather show them in the Octagon instead of talking about it beforehand. The former one-time title holder owns an impressive 17-2 professional record and was last seen retiring Randy Couture at UFC 129 back in April. Although Machida acknowledges ring rust could play a factor in his return, the veteran has kept his skills sharp and isn’t too concerned about his extended layoff. What the Brazilian might have issues with is gaining access to middleweight king Anderson Silva. Machida doesn’t believe his buddy will be available to train with him given his demanding schedule. Regardless, they share the management team and the request has been submitted. UFC 140 takes place December 10th inside the Air Canada Centre in Toronto. The light heavyweight title affair will headline the pay-per-view broadcast.